#mixtape is a feature in which we ask someone to send in a playlist of ten of their favourite tracks of all time and then get them to say a few things about each track – memories they associate with them, why they’re cool and so forth. The idea being to see what we can gauge from someone’s music taste whilst listening to some cool tunes. 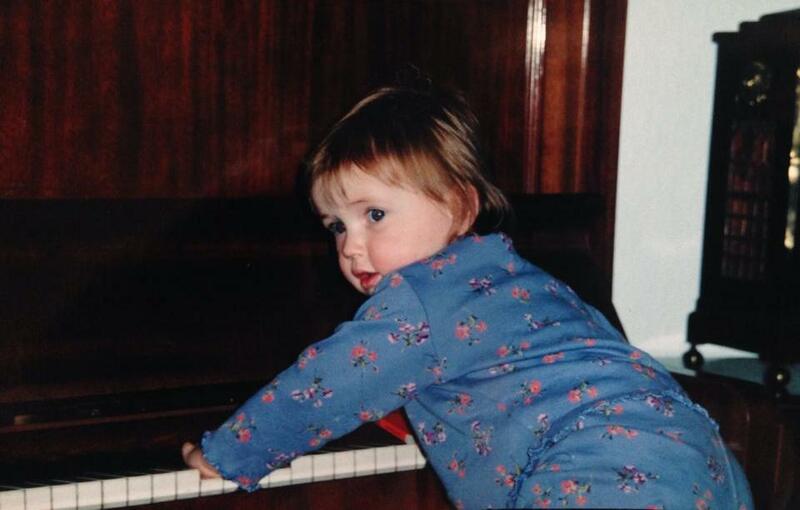 Honing my music skills back in the day. I love music. Like so much. It’s literally my life. Ever since I was little, it’s been just that. Starting from age seven, I studied classical music and sang, so my entire childhood was filled with music lessons, choir and indeed, band camp. For the past two years I’ve spent the best part of my uni life, avoiding my degree and singing with my a cappella group, The Alleycats, covering songs of all sorts of genres and indulging in my first love. Consequently, I now have a very broad and confusing taste in music. That said, choosing ten of my all time favourite songs was super duper hard. Anyway, I have come up with an extremely random, and quite contrasting playlist filled with some tunes that I will never get sick of. This #mixtape had to contain something from my all-time musical queen: Beyoncé. I’ve loved her all my life and will continue to worship her forever and ever. I literally cannot choose one Bey song as my favourite, but I thought I’d kick things off with ‘Grown Woman’ because I’ll never ever ever get sick of this track. It makes me wanna dance and will always cheer me up. It is just fabulous in every sense of the word. Also, child Bey in the video has 10000x more sass than me and that makes me equally sad/in awe of her. This song is such a tune. I love it so much. I’ll sometimes go for ages without listening to it and then I’ll hear it again and be filled with so much nostalgia. My dad used to buy my brother and I The Killers’ CDs when we were younger and I remember every summer on our two day drive to France that, if we were good enough we got to choose a CD to play – this was always a winner. It is just so good. The Staves have quickly become one of my favourite bands. I love everything about them and often wish I were born into their family and part of their super cool trio. Their folksy, acoustic sound is so beautiful and their voices compliment each other so well. Also their new album, If I Was, is just out and it’s incredible. My dad has had such a strong influence on my taste in music. It’s annoying because I used to complain about the music he played (all I wanted to do was listen to Beyoncé and Kelly Clarkson) and he would tell me that I would change my mind when I was older and he was so right. I still adore Bey and Kelly but Johnny Cash is a god. Whether it’s this or ‘Hurt’ – his music is just so raw and real that it always gives me goosebumps. I love Bruce Springsteen. Another artist who I was luck enough to grow up with thanks to the padre. This is definitely my favourite. In the summer of 2013, I got to see him perform in Glasgow and it was honestly one of the best nights of my whole life. He is 65 and still performs over three hours a time. Also he is still very fit. I had to include a classical number. This is one of the most beautiful pieces of classical music I’ve ever heard. I like to imagine listening to it aged 100, totally content and surrounded by my 27 grandchildren. Another pretty recent discovery of mine is this duo. Their music is so out there and funky, all with sick and kind of unusual percussive beats. They’re French-Cuban and they sing in English and Yoruba, a Nigerian language their ancestors spoke. A lot of their music is actually inspired by old Yoruba folk songs – which is pretty darn cool. Anyways they’re amazing and everyone should check them out. I spent the last two summers working in Madrid as an au pair and this song reminds me so much of that. The 13 year old I was looking after was obsessed with it and made us watch the music video on repeat every. single. day. Anyway, it is a fun song and reminds me of some of the best times I’ve ever had. The 2014 break up of folk duo, The Civil Wars, was heartbreaking and makes me sad every time I think about it. If I couldn’t be in The Staves, I would want to replace Joy Williams. This tune is excellent, as are all of their songs. Also ‘Poison and Wine’ is my most played track on iTunes – never getting sick of it. So there concludes my #mixtape. Bob Dylan, Norah Jones, Bon Iver – all almost made the cut and if you ask me for a #mixtape tomorrow, my list would probably be completely different. Caitlin is a second year French and Spanish student at the University of St Andrews. When not singing with her a cappella group, The Alleycats, Caitlin can be found jamming out to Beyoncé and walking her baby (translation: dog) Bronte. She is able to play the piano and the bassoon and is currently attempting to master the guitar. Such is Caitlin’s superstardom that she and her a capella group have recently filmed a secret project in Egypt. Expect a BEYONCÉ from them to drop at some point in the near future. I read this article and found it very interesting, thought it might be something for you. The article is called Above & Beyoncé – #mixtape and is located at http://prancingthroughlife.com/2015/05/01/above-beyonce-mixtape/.